Looking for an Electrician in Dacorum, then Berkhamsted Electric & Electronic Services are here to help. With experience in electronics & electrical work covering the last 30-years, you know that you will receive a quality service where customer service is our main driver. Providing everything from changing a socket to designing and installing a full re-wire of your home, we can meet all of your electical needs. SMART control installations, controllable through your mobile phone or tablet. Hertfordshire-based electrician is crowned with regional Vanarama Van Hero Award. 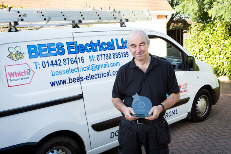 Mike Smith of Hertfordshire-based Bees Electrical Services is “just buzzing” after being selected as a regional finalist in a nationwide competition to find Britain’s Best Van Hero. The electrician fought off tough competition from masses of other trades and industries from all corners of Britain …. continue reading.